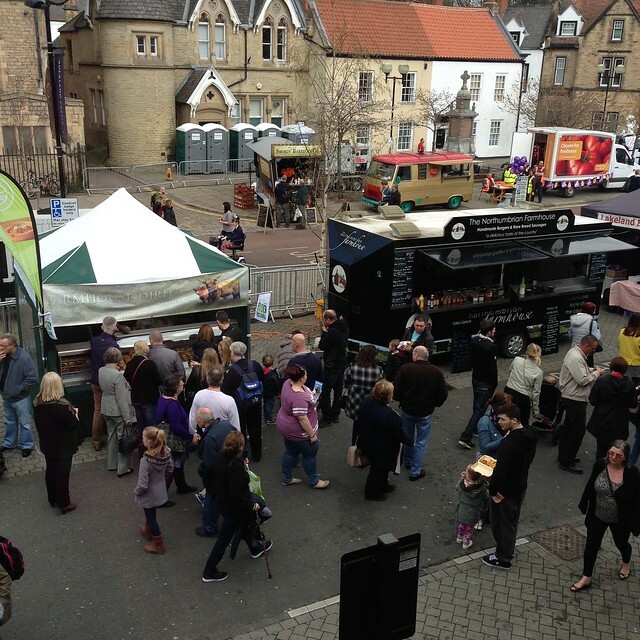 On Saturday the 18th of April we headed to the Bishop Auckland Food Festival . Luckily for us we had a chauffeur, o.k. maybe not a real chauffeur, no cap and uniform etc. But a friend opted to be the designated driver for the trip. Happy Days! 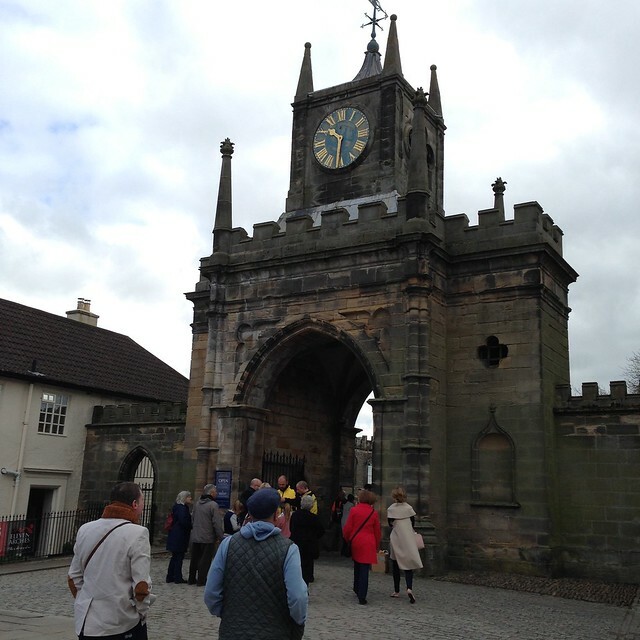 We motored from Easington Colliery to Bishop Auckland, where we easily found parking in the town centre. 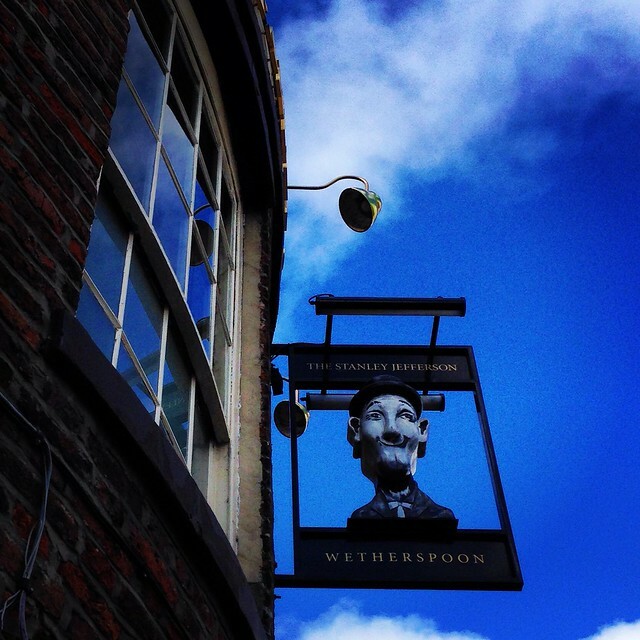 While the goal was the Bishop Auckland Food Festival, our first stop was The Stanley Jefferson (5 Market Place, Bishop Auckland DL14 7NJ), a Wetherspoon pub which is right in the centre of Bishop Auckland. 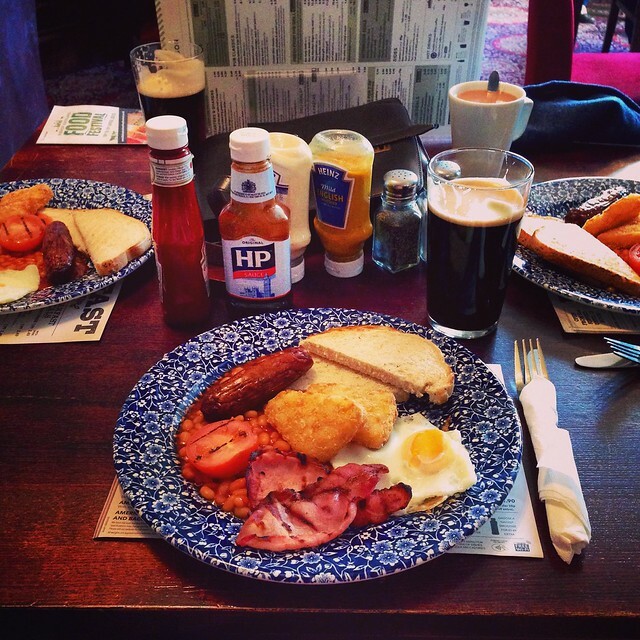 We ordered 3 classic breakfasts; a basic fry-up consisting of egg, bacon, sausage, hash-browns, tomato, baked beans, and toast. Cheap and filling, grub – no complaints from us. 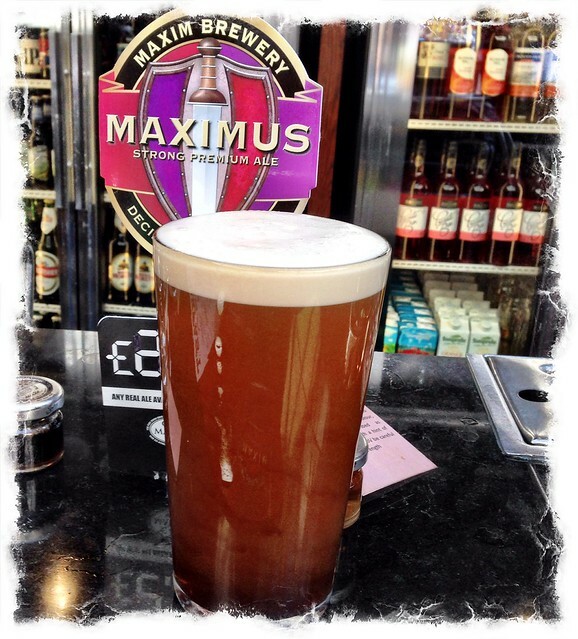 To help wash the food down we ordered a pint of Maximus (Maxim Brewery) for me. Mrs. R had a pint of Coffee Porter, also from the Maxim Brewery. Our chauffeur had to make do with a cup of tea. Breakfast and beer out of the way we headed into the Bishop Auckland Food Festival, which started just outside The Stanley Jefferson where several stalls were selling various cooked food items; pies, burgers, hotdogs etc. Having had our fill of beer and breakfast, well, at least two of us with regards to the beer, none of the cooked food that was available in Bishop Auckland Market Place was really of any interest to the three of us. In fact when we started browsing the fresh food stalls, the small samples on offer were also of little interest, given our full bellies. Despite having deliberately eaten before we started shopping; so as to stop ourselves buying absolutely everything we saw (we always try not to food shop on an empty stomach) , we (Mrs.R and I) managed to ignore our bursting waistlines and make a few purchases. Our chauffeur, who will hence force be called Paul, also got in to the ‘retail therapy mode’. Given the beer and carb buzz from breakfast, I can’t remember the exact order of our shopping, so the rest of this blog post is a bit of a blur. We wandered round looking at the food stalls, stopping whenever the goods got our tastebuds tingling. I think our first purchase was a couple of rosemary sourdough rolls. We ate them that same evening. They were nice bread rolls, we could taste the rosemary, but their sourdough heritage seemed a little slim. I’ve made a lot of sourdough bread over the years, and this bread really did not have a sourdough flavour, or texture. 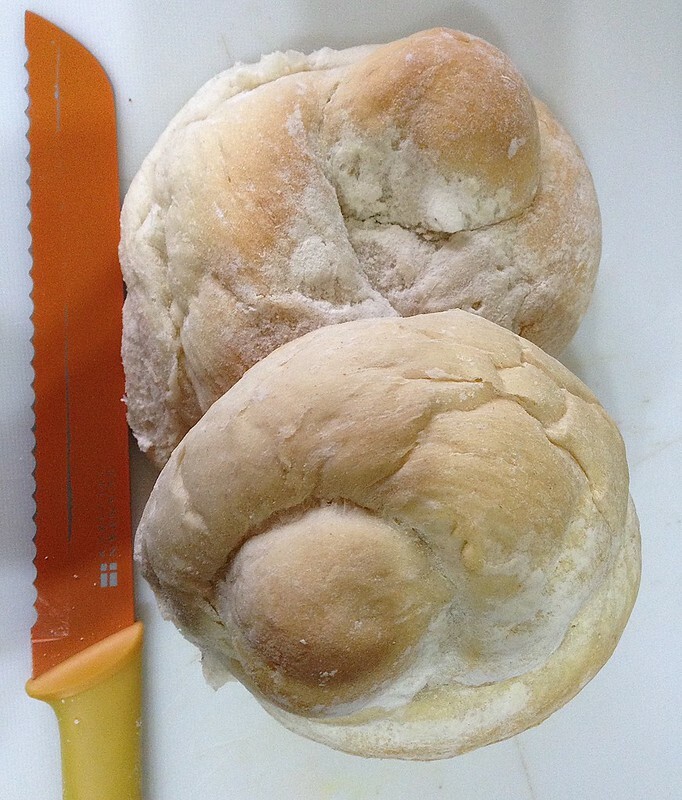 Mrs.R said she didn’t think they particularly tasted homemade either, more like basic supermarket white bread rolls – she said they were very ‘white bread’ – literally. 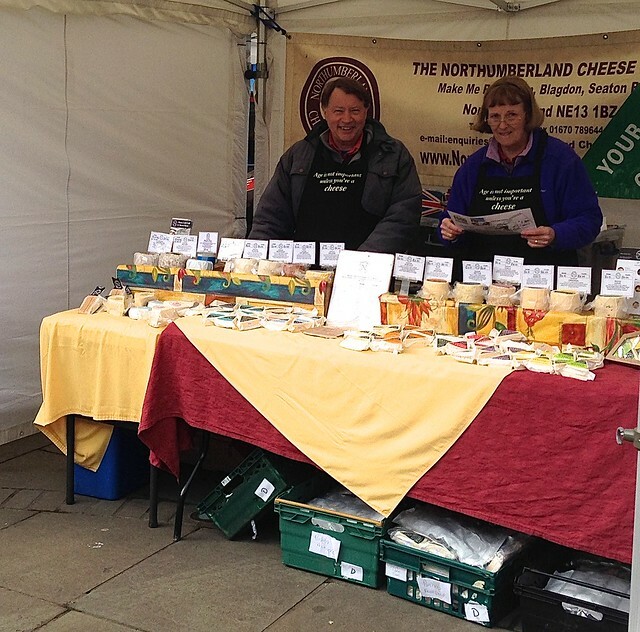 Next stop was the Northumberland Cheese Company stall, where we purchased a small block of Elsdon goats cheese, and Paul, having tasted their Cheviot cheese, and the Blagdon Blue, decided to buy a block of the Cheviot cheese. The couple running the cheese stall seemed happy to chat to us about the various cheese they were selling, they were friendly, and now they’re famous – that’s them below. When you have bread and cheese, what could you possibly want next? The obvious answers is sausages. 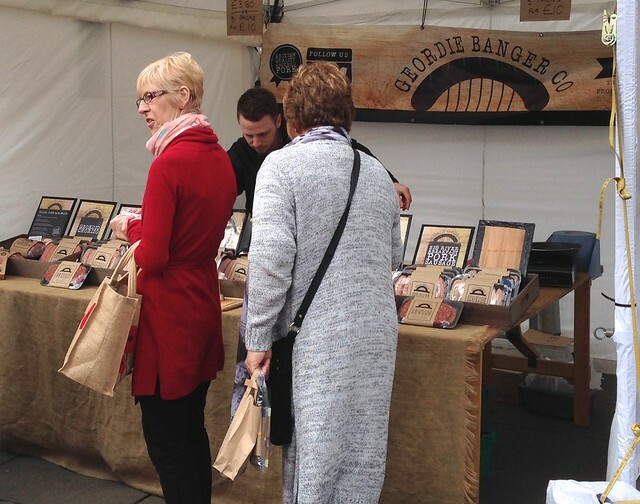 While we may have been a little South of Geordieland, we could not resist buying a pack of Geordie Banger Sausages from the Geordie Banger Co stall. The guy working on the Geordie Banger Co stall was cooking a fresh batch of sausages for customers to sample, but we didn’t want to wait to taste them, the seriously good aromas coming from the pan was enough to make our mouths water. 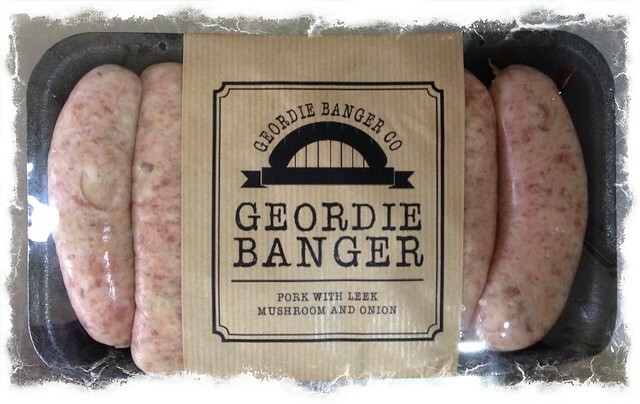 The Geordie Banger is a pork sausage with leek, mushroom, and onion. 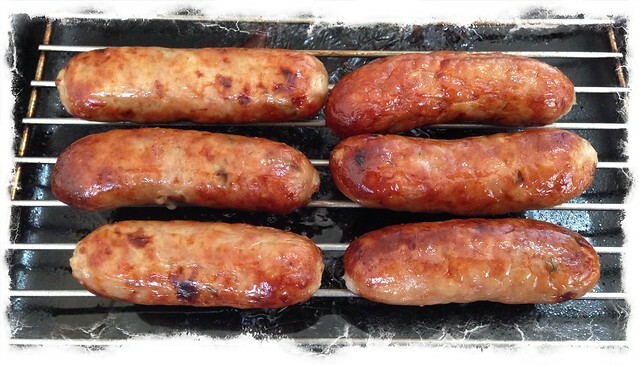 I grilled the Geordie Banger sausages for our lunch the day after purchasing them. The sausages were very tasty, good and meaty, excellent flavours, and no nasty gristle or chunks of fat that some sausages have in them. They were excellent, and we’d definitely buy them again. 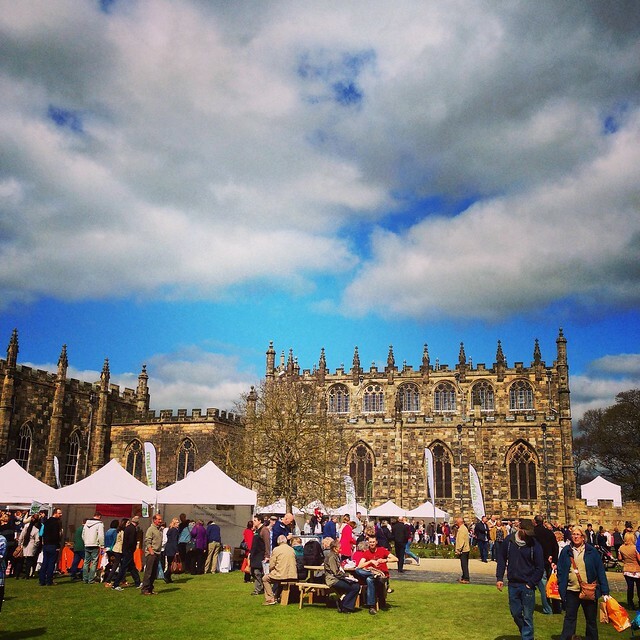 Bangers bought, we then headed into the grounds of Auckland Castle to explore the other sections of the market. Paul was keen to get to the Arts and Crafts tent, because he had his heart set on a tweed man-bag, but sadly he could not find one. 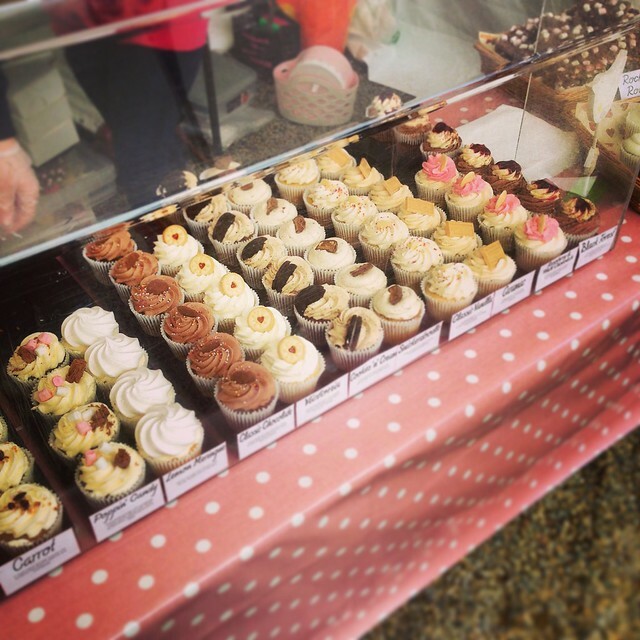 Paul was gutted about the lack of tweed man-bags, but suddenly his eyes lit-up with joy – he’d spotted a market stall selling cupcakes. 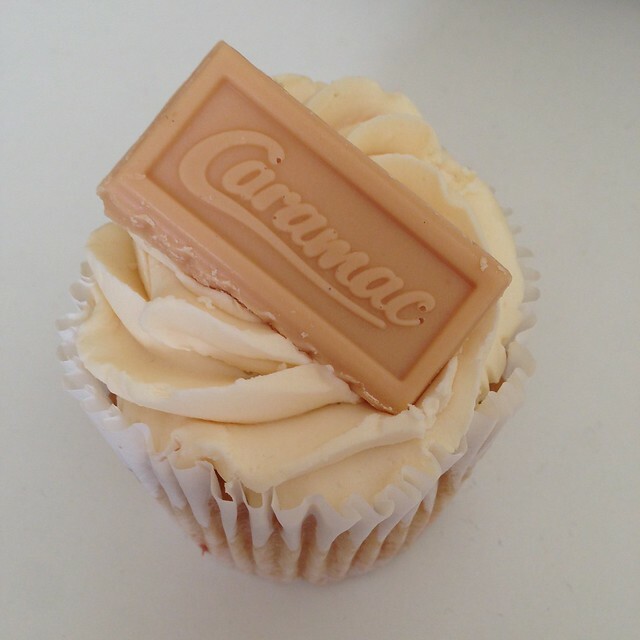 I’m not sure how many cupcakes he bought and scoffed, but by the time Mrs.R was served she had to limit herself to just one cupcake – a Caramac cupcake. Mrs.R wasn’t too disappointed that Paul had almost left the cupcake stall bare, because she said she doesn’t particularly like cupcakes, but that she had a craving for some full-on sugar. It wasn’t until later that evening that Mrs.R finally ate her Caramac cupcake, which was as she’d expected a serious sugar-rush. In fact it was seriously sickly sweet, and a good reminder to her of why she rarely eats them, and why she doesn’t consider cupcakes a favourite sweet treat. 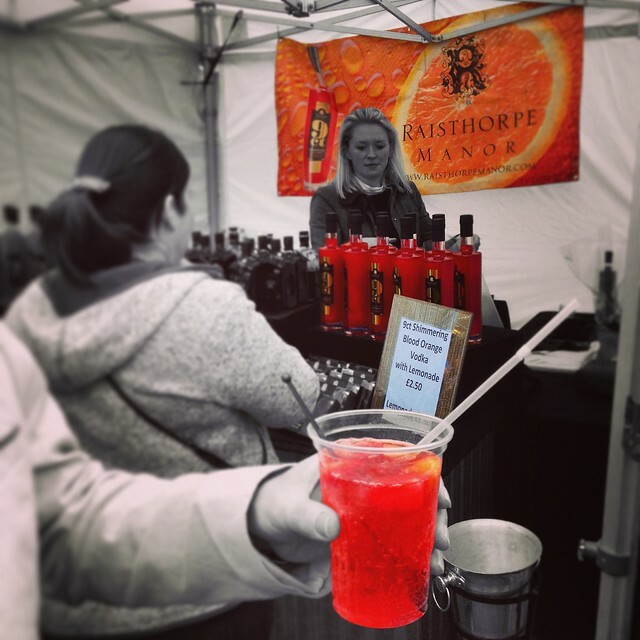 With all of the cupcake excitement, Paul was the over-excited one, not Mrs.R, I decided it was time for a refreshing drink, so treated us to a 9ct Shimmering Blood Orange Vodka with Lemonade from the Raisthorpe Manor stall. The drink was pleasant, lots of ice, a couple of pieces of strawberry, a piece of cucumber, and for just £2.50. By now Mrs.R was feeling a little guilty, at having left our dog, Barley, at home to fend for himself, so she was over-the-moon when she spotted a stall selling dog treats. We purchased a small bag of Wellybix lamb flavoured dog treats for the mutt, which slightly lessened the guilt Mrs.R was feeling. Later at home as we unpacked our shopping, Barley was very interested in the dog treats. 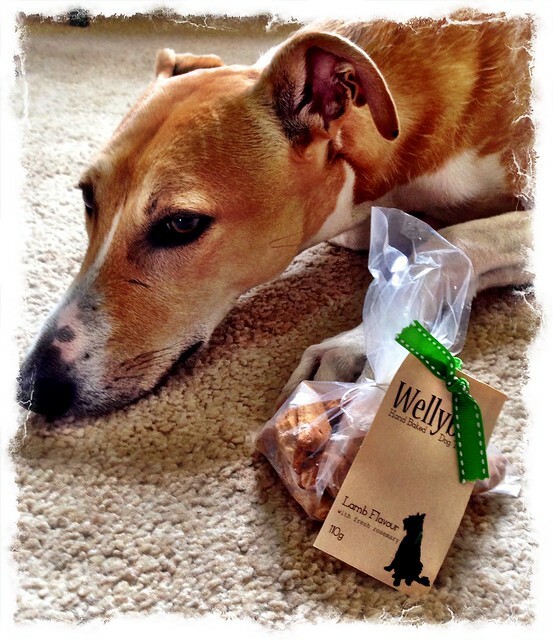 As soon as he saw the bag, he got busy sniffing and salivating, and having eaten a generous amount to test the taste and quality, he said Wellybix dog treats are his new favourite – but he would prefer us not to go out without him, surely these treats can be ordered by post. I also had guilt issues at having left Barley our Lurcher at home, but buying dog treats would have done nothing to assuage my guilt, so there was only one thing to do – and that was to head to the Tipple Tent for a beer. First up was a pint of Griffin’s Irish Stout from the Hill Island MicroBrewery (Fowlers Yard, 7 Back Silver Street Durham DH1 3RA). 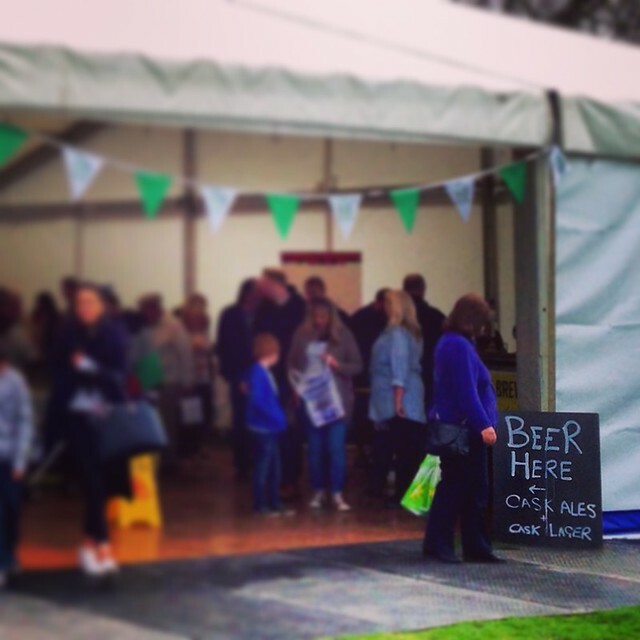 The people on the stall were friendly, the beer smelt good, and it tasted really good too, it was a decent stout. 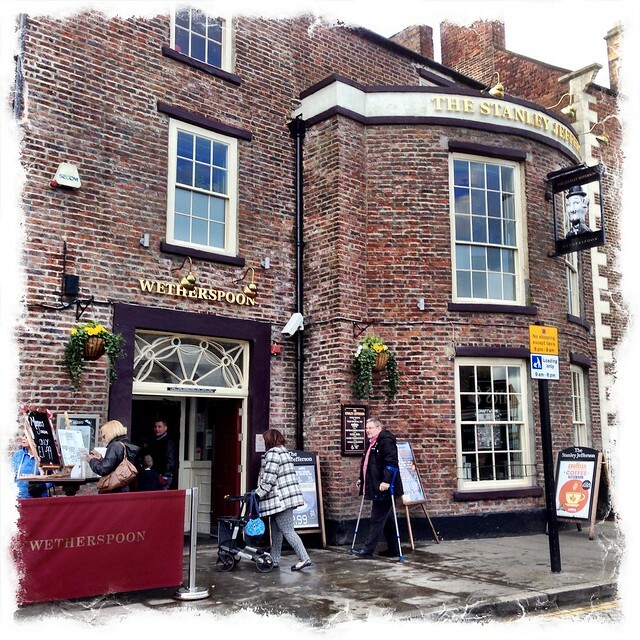 We would have happily stayed for a couple more pints, but we didn’t want to abuse our nominated driver. 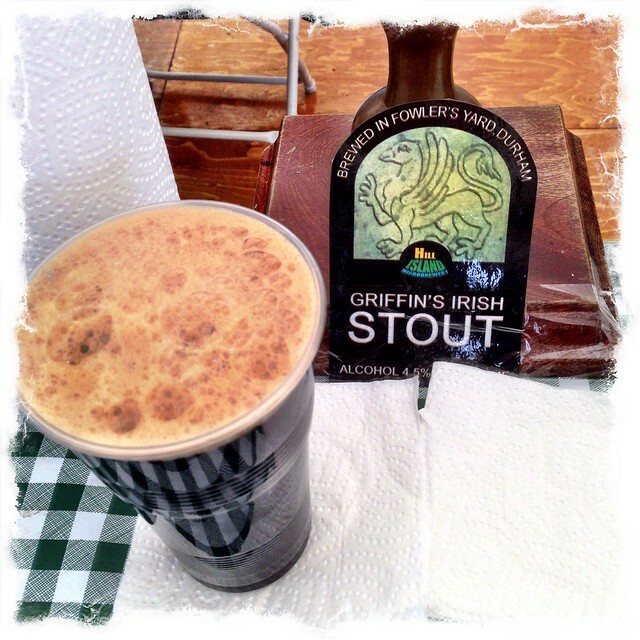 Mrs.R and I shared the pint of Griffin’s Irish Stout while multi-tasking – seeing what else was on offer in the booze tent. The last stall we looked at also sold beer, and we thought it would have been rude of us not to try a pint of that beer too. 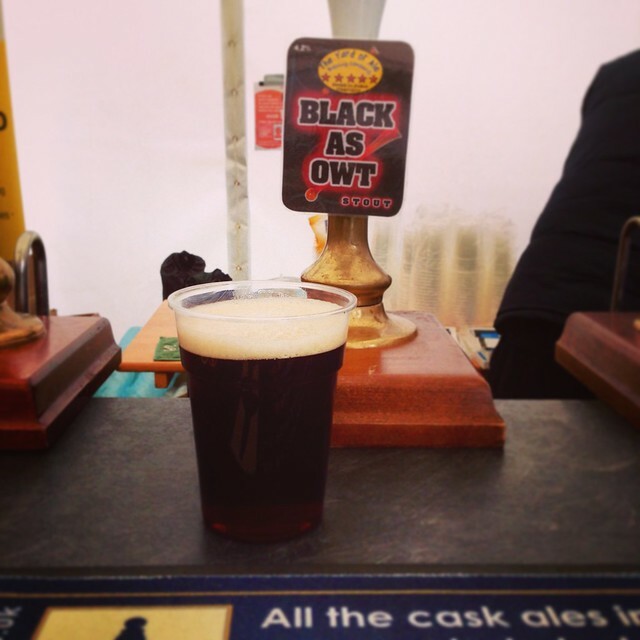 We ordered a pint of Black as Owt from the Yard of Ale Brew Company. This beer was also pretty decent, although a much lighter stout. 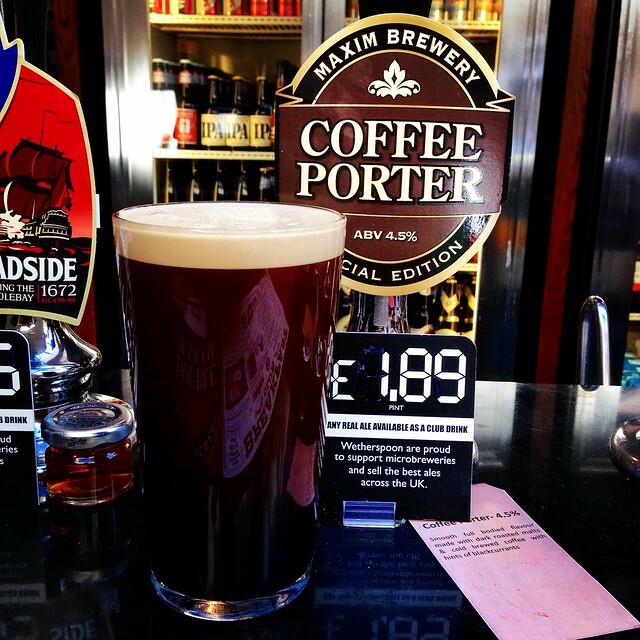 It was as I paid for the pint of Black as Owt and Mrs.R took a photo of the beer pump that we were treated to a proper belly-laugh. A guy standing at the stall watched Mrs.R take the photo, turned to his girlfriend and said. ”Beer Nerd!” Hahaha! A more accurate description would be ‘Photo-Nerd’ as she’s obsessed with taking photos. A pint of Stout in our hands, we left the Tipple Tent, but for some illogical reason we could not take our drinks out of the Tipple Tent area. A bloke wearing a security vest told us that alcohol was not allowed out of the area. We thought this was very odd for several reasons. 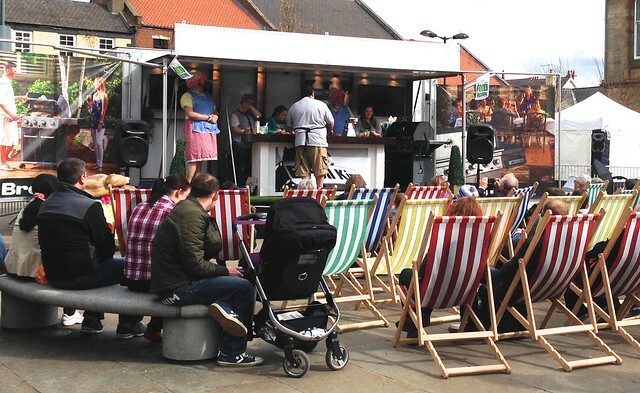 The main reason being that the Bishop Auckland Food Festival website stated that you could take drinks to food areas, and what was even more odd was the fact that you could also buy drinks in other parts of the Bishop Auckland Food Festival area. This silly rule meant that we had to stay in the Tipple Tent area to finish our beers. But on the plus side we found some seating, and the sun was out. Back in the food stall area, having caned our beers; because we didn’t want to sit down for ages supping them, we made a few more purchases. 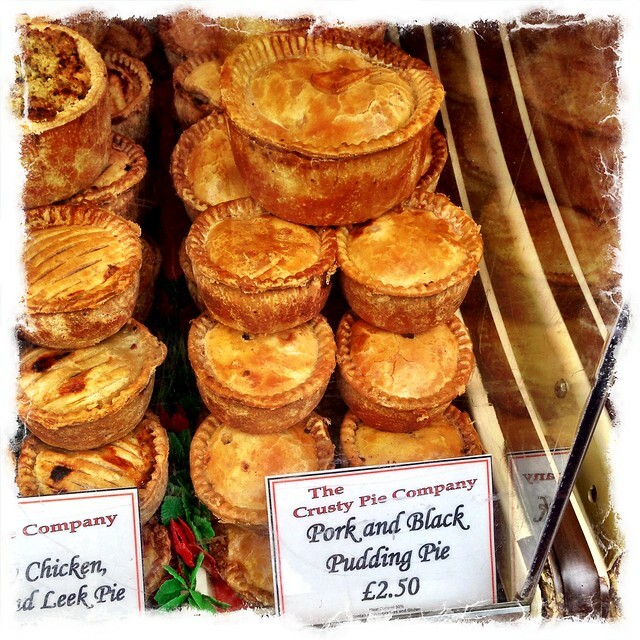 I picked up a Pork and Black Pudding Pie from the The Crusty Pie Company. 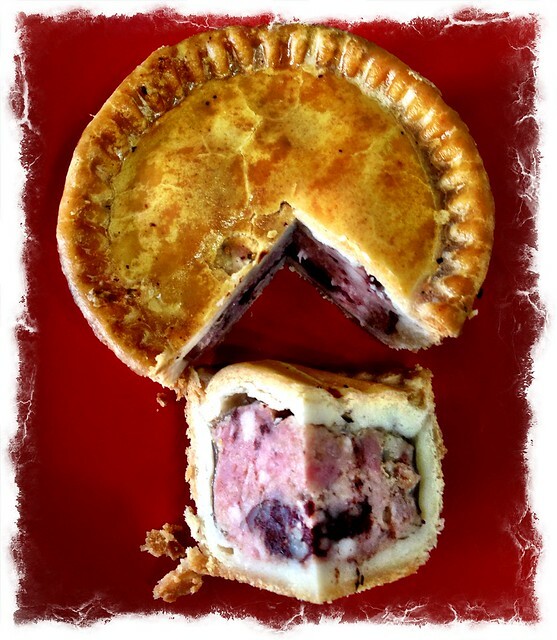 I am a fan of pork pies, if they’re good quality, and this pie was extremely good. I really wish I’d bought more of them. Delicious! 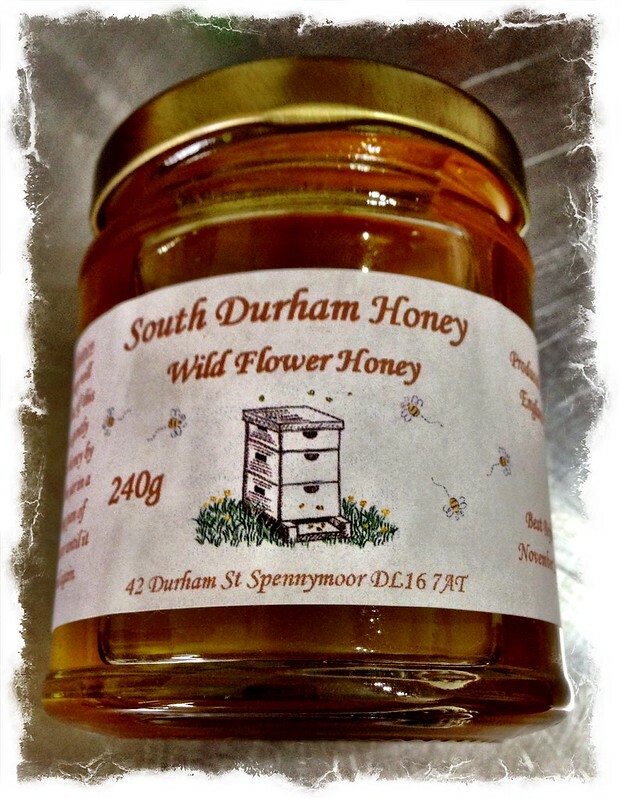 Both Mrs.R and Paul purchased a jar of Wild Flower Honey from the South Durham Honey stall. There were several different types of honey available, but having tasted the Wild Flower variety they said it was so good they didn’t need to try the other flavours. The Wild Flower Honey is not too sweet, with lovely floral flavours. 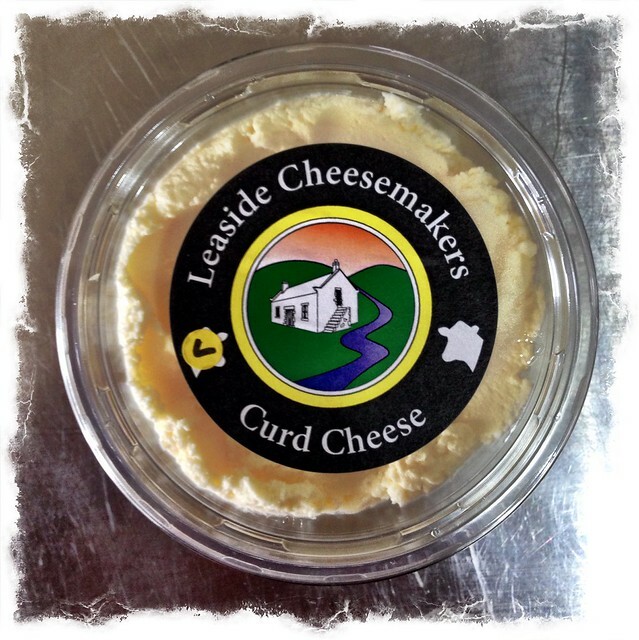 Our last purchase of the day was a small pot of Lemon Curd Cheese from the Leaside Cheesemakers stall. We haven’t eaten any yet, but I did have a tiny taste and it’s nice, very creamy, a good amount of lemon flavour, and sweet. I doubt it will be in the fridge for very long, before we scoff the lot. The three of us had a very good morning at the Bishop Auckland Food Festival. In fact it was far better than we had imagined. There was a very good range of fresh local produce, ranging from bread, meat, game, cheese etc. Paul said it was definitely worth the drive. Disclaimer: Paul neither likes tweed man-bags, or cupcakes – but he loves driving, so hopefully he’ll be our ‘Chauffeur’ for the Bishop Auckland Food Festival next year. 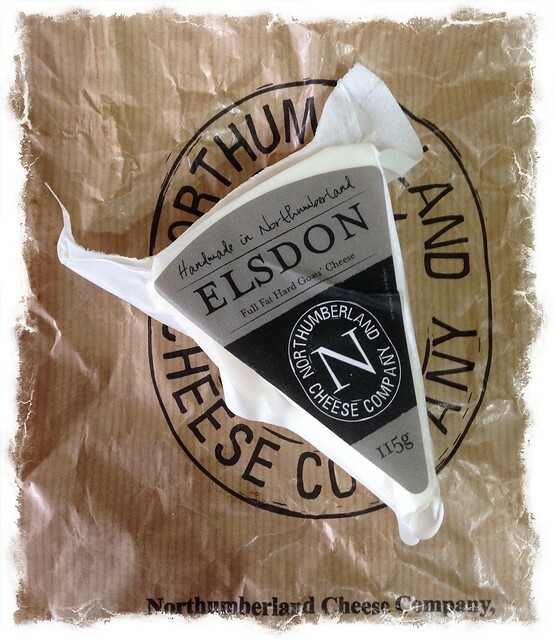 This entry was posted in Beer Adventures, Bread, Our travels in England and tagged Bishop Auckland Food Festival, Elsdon, Geordie Banger, Leaside Cheesemakers, Maxim Brewery, Maximus, Raisthorpe Manor, South Durham Honey, Stanley Jefferson, Wellybix on April 19, 2015 by Richard.